Attracting Purple Martins in order to watch them as they mate up, pick nesting cavities and raise their young will require patience and education for most "want to be landlords". 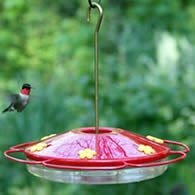 Understanding their habitat requirements are important factors in getting these birds to nest in your backyard. Using the information about house placement, and the martins nesting habits, we hope to help you get started in not only a fun hobby but a much needed support for these birds. With the competition from Starlings and House Sparrows, it becomes important for humans to do all they can to protect these birds. 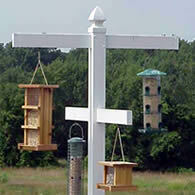 Following time tested practices will give you the best chance at attracting Purple Martins to your backyard. It's important that you learn all you can. 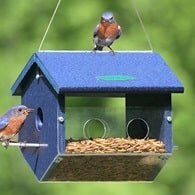 Simply placing a house up may be enough to attract wrens to your backyard, doing the same for these birds will only lead to hatching more house sparrows and starlings. Two of the martins enemies and competition for nesting sites. 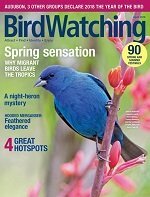 Two resources I highly recommend for learning more about these birds are: Enjoying Purple Martins More by Richard Wolinski and Stokes: Purple Martin Book by Donald & Lillian Stokes Don't skip on this part. The more information you have the better when it comes to these birds. Locate your housing in the center of the largest open spot available, at least 30 and not more than 100 feet from human housing. So many people fail to attract Purple Martins because of placing their houses too close to trees and too far from human habitation. There should be no trees within 40 feet of the nesting site and preferably further away. In the South (probably because martins are more numerous) you can get away with placing your houses within 25 feet of trees. While you may see others having success with housing close to trees, it's better that new colonies be established as far away as possible from trees. The height of the house should be in the range of 10-15 feet with 12 - 14 about average. Don't attach wires to the house or pole. Predators can use them to get to the birds. Don't decide you can't attract these birds simply because you have a tree around. If you've got a couple of long flyways you may still be able to get them to nest. My own setup is in an area most would say didn't have a chance. But I admit, I worked hard at getting martins and became successful. As you begin to attract Purple Martins to your nesting site, you'll need to take precautions to protect them from predators. Some of the predators are raccoons, snakes, squirrels, and owls. The use of baffles on the pole can detour predators that climb. In the South where fire ants are numerous, try keeping a ring of petroleum jelly on the pole. Don't kid yourself, snakes can climb just about anything, so, wrap bird netting around the pole. Snakes will have to be cut out of it but you'll still have your birds. If a colony gets raided by a predator the whole colony may relocate and never come back. It's been said that adults are rarely attracted to new breeding sites and while mostly true, last seasons second year birds come back as adults and start new colonies if they didn't mate the previous year. Once you've attracted Purple Martins that nest successfully, you'll be able to attract them back and add more with time. The first pairs have to experience nesting success or they won't return. In my own case it was and adult male that started my colony. He hung around the season before but never stayed the night. I can't really state as fact it was he without banding, but I feel safe saying it was the same one. Attracting Purple Martins to a first year colony is typically begun with last year's young (Sub-Adults). These are the ones that (generally speaking)colonize new sites. They begin arriving about 4 weeks after the first adults show up in an area. So for new colonies, if you see adults at other sites, you can expect the second year birds in roughly four weeks. Since the first time nesters arrive later than the adult scouts, it's best to keep your houses closed until it's time for them to arrive. Otherwise you'll be giving House Sparrows and Starlings a 4 - 8 week head start. On the other hand, if you're serious and control starlings and house sparrows by trapping or shooting, you can open your housing sooner. Sometimes old houses are damaged or people move and adult birds will be looking for a new nesting site. I warn you though, if you don't have the stomach for dealing with starlings and house sparrows you'll have a much more difficult time attracting martins. Migration is a staggered occurence. Birds arrive for 8-12 weeks in the north, 16-20 weeks in the south. The first birds to make it back nest in the south and have been recorded as early as December in Florida. These birds can arrive and begin nesting up through the end of June, range wide, so keep your housing ready, don't close it up, or let other birds use it. Never allow any other bird to use your housing. Even if you get no birds this season. These birds look and visit housing througout the season and if you let other bird nest, you may never get the ones you want. Your chances for attracting Purple Martins will be better if your housing is easy to manage. Choose a pole that at a minimum telescopes, or better, is equipped with a winch or rope & pulley, and housing that has easy access to the compartments. An easy to manage system will make cleaning House Sparrow and Starling nest easier, giving you a better chance at attracting Martins. You'll need to be able to monitor each nest of martins in your housing to provide assistance in certain situations. Easy access makes for better monitoring and even faster end of season cleaning. Gourds are available both as natural gourds and commercially made gourds. I use the commercial gourds as they never rot, are easy to keep clean and are acepted by the martins as easily as the naturals. All of mine have tunnel entrances with Starling resistant entries. I choose to use gourds and no other type of housing. (a personal preference) You can see mine in the videos below. Placing a handful or two of dried white pine needles, dry twigs, or straw may be helpful in attracting Purple Martins. A supply of mud close by can be helpful to those of the species that use mud to place around the opening. Not all use mud. When attracting Purple Martins, color of housing should be considered. Houses and gourds should be white, or a light color. White housing seems to attract them best and the color reflects sunlight. Temperature extremes can be detrimental to the young birds. The Cavity floor dimensions have in the past always been 6 inches by 6 inches, and have been and still are, good at attracting Purple Martins. But, larger cavities 6 - 7 wide and 8 - 13 deep have been proven to be preferred by these birds, maybe because they offer better protection from predators and rain. A round entrance hole of 2-1/8 inches is the preferred size opening although they will use an opening in the 1-3/4 - 2-3/8 range. Due to Starling competion, manufactures are making houses and gourds with Starling resistant entrance holes (SREH) These may be cresent shape or a host of other shapes. These types of openings are highly recommended in Starling areas which is most of the nation. I would caution using round openings due to starlings. You'll have enough problems dealing with house sparrows. Some people have had success attracting Purple Martins to nest at a new site by playing the Dawnsong. This CD is available from the PMCA. Played early in the morning it's said to at least attract them to the housing. It may not get them to nest, but it may get them to take a look at your housing and that's a start. I've played mine at all times of the day when I've been outside and it does attract martins. Don't give up because others have martins and you don't. Closing too soon may keep you from ever becoming a landlord. Keep your houses open until late August, as this years fledglings will be searching for next year's breeding sites in late summer. When you do close down your housing, give it a close inspection. Remove all nesting material and scrub with a 10% bleach solution (1 part bleach to 9 parts water). Let it air dry before storing for the winter. Take care of any repairs now so you'll be ready in the spring. If you choose to leave it out for the winter, be sure and plug the entrance hole. 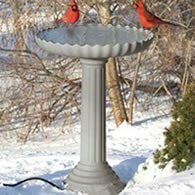 otherwise, House Sparrows and Starlings will begin to use it in late winter, making it impossible to get them to leave in the spring. When it comes to attracting Purple Martins one has to be willing to never give up. Some get them in a year or two and others may take twenty or more years. You'll have to decide how much patience you have. It took me four years to attract Purple Martins and for the past few years it has definitely been worth it.